It’s moving. It will be moving all day, all night, and for a billion tomorrows. 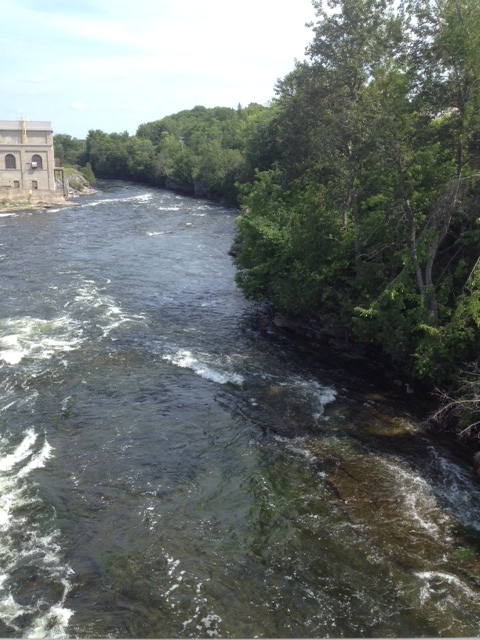 The Otonabee River is a block from my home and on quiet nights we hear it relentlessly cascading over the dam. We smile at a loon’s mournful echo, nature’s saddest and most magnificent cry. The blue heron has his favourite spot near the Lakefield bridge and sometimes the osprey leaves his giant nest by the power station to perch in the tree above him. Both stare with infinite patience, waiting for the right moment to pounce into the gurgling water. I walk home from work along the river and run the trail that hugs its banks. In the summer, when the city folks invade, canoes glide by and rented houseboats boom their music as they tack haphazardly along amid the mammoth floating mansions, always, it seems, with flapping American flags. The river splits our little Village in two and yet its bounty makes us whole and, in fact, possible. Deeply respected Canadian novelist Margaret Laurence lived in Lakefield. Her most stunning book, The Diviners, begins by observing that the river runs both ways. It does you know, it really does – all rivers do. They run as natural facts but also as spirits and metaphors through our history, literature, music, and souls. Science meets religion at the intersection of the Tigris and Euphrates. Between the two powerful rivers is the fertile valley where archaeologists insist human civilization first developed. Those ascribing to a literal translation of the Christian Bible agree, in a sideways sort of fashion, by claiming the junction housed the Garden of Eden. Homer gave us one of our first stories. He told of the filthy waters of the Xanthus. Polluted by bodies killed in the Trojan War, the river rose up and nearly swallowed the hero Achilles. The river became a metaphor for war, a scourge so horrible that even the unworldly strength and courage of the greatest among us can neither defeat nor tame it. War has too often soiled rivers with its evil. Battles have been won by fording armies, a bridge’s destruction, or an enemy trapped against a riverbank. During the American Civil War, the South named its armies after states but the North after rivers, hence the Army of Virginia fought the Army of the Potomac. Early battles had two names because the South considered the nearest town and the North the nearest river, so we have Sharpsburg or Antietam and Manassas or Bull Run. Many civilizations developed along rivers from the Yangtze in China, the Amazon in Brazil, and the Nile in Africa. A predominant historian dubbed Canada the “Empire of the St. Lawrence,” arguing that without the natural highway to the interior, the country could not have developed when or how it did. Consider also the cities built upon rivers: Montreal, Calgary, Ottawa, New York, Washington, St. Louis, London, Paris, Moscow, Berlin, and…well…you can think of many more. Rivers are the veins through which so many cities’ lifeblood flows. The Tennessee is the Singing River. To hear it you have to believe it. For thousands of years the Whana-le people heard the creator sing through the river’s sparkling waves. In the 1830s, the Whana-le were uprooted and banished to the barren Oklahoma Indian Territory. They starved beside tiny and silent rivers. One winter, an old woman named Te-lah-nay had enough. To save her family and people, she sought the wisdom of the river’s song and so walked from Oklahoma to her ancestral home, now called Alabama, on the banks of the Tennessee. Today, in northwest Alabama stands a long, winding, outrageously magnificent stonewall that her great-great-grandson Tom Hendrix created to commemorate the walk, his people, and the river that still sings for those with the spiritual faith to hear. On the banks of the Tennessee is a town called Muscle Shoals. In the late 1950s, Rick Hall built the FAME recording studio and it soon produced hit records that reintroduced gospel, R & B, and soul to the pop charts. Percy Sledge, Aretha Franklin, Etta James, and Wilson Pickett recorded there. When Hall’s studio band, the Swampers, formed their own studio, the Muscle Shoals sound was heard in records by the Rolling Stones, Paul Simon, John Prine, Jerry Reed, Lynyrd Skynyrd, Alicia Keys, and on and on. The Muscle Shoals feel was black but the studio musicians were white so the music was as colour blind as it was glorious. The singing Tennessee must have approved and maybe, just maybe, played a role in inspiring the magical sounds. Maybe it was the same enchantment that flowed from the mighty, muddy Mississippi that gave birth to rock ‘n’ roll in Memphis when, within blocks of the roiling river, Roy Orbison, Johnny Cash, B.B. King, Jerry Lee Lewis, Carl Perkins, and Elvis Presley all did their best work in the same little Union Avenue Sun studio. Maybe the same spirit sang from Liverpool’s Mersey River that created what the world came to know as the Mersey Beat of the Beatles and British invasion. 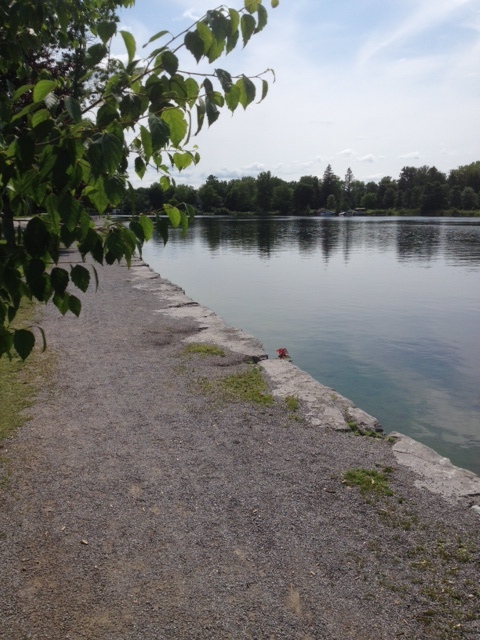 I am both haunted and comforted by those thoughts as I prepare for my run along the banks of my river, the Otonabee River. The heron may be at the bridge and perhaps the osprey, and down near the Sawyer Creek lock the turtles will be sunning themselves. The bald eagle may be about, soaring without a care above it all and swooping with breathtaking majesty to steal his lunch from the river that he, like me, knows will always be here: powerful, relentless, with soul but without judgement. And through it all I am happy that in my Village, and my life, a river runs through it. If you enjoyed this column please share it with others through Facebook or your social media of choice and consider returning for my regular Monday morning postings. Thank you.